My kitchen and breakfast nook area is wonderfully bright and airy, thanks to a well-placed sliding glass door into the backyard. 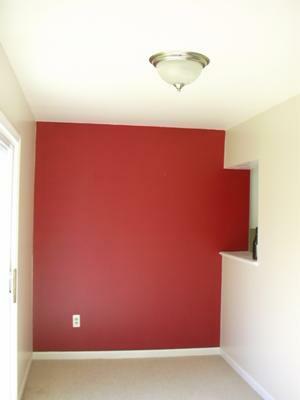 However, it definitely needed a little more personality, which I added by painting the back wall this vibrant red shade. I chose the smallest wall in the room to keep it from feeling "too red", and I loved the way it turned out. I made sure I brought home samples of the paint before tackling it, as I knew changing my mind on the color would be a disaster - painting over red walls can be a nightmare. I settled on this "blue" red color that just lends a little bit of sophistication to an otherwise plain room in the house. Just that pop of color brightens my morning! TIP: I would definitely recommend spending the extra cash on the high end painters' tape, however - the cheaper tape runs a much higher risk of "bleeding" on your other walls, which ruins the whole effect. A statement wall is the way to go if you like bright, bold colors but are afraid to use them too liberally. I really like this paint color. What is the name of the paint?